I remember back in the day when recal and oral thermometers were a thing. I remember those little glass wands being so thin and fragile. A few broke in my house when I was a kid and a tiny ball of mercury came out. Then came the little digital thermometers and in school they used these things called temp dots that were a thin flimsy plastic with little dots that would change color with your temperature. Eventually the ear thermometers were a bit more common, still are, in fact, and the forehead thermometers that can be swiped across from temple to temple. 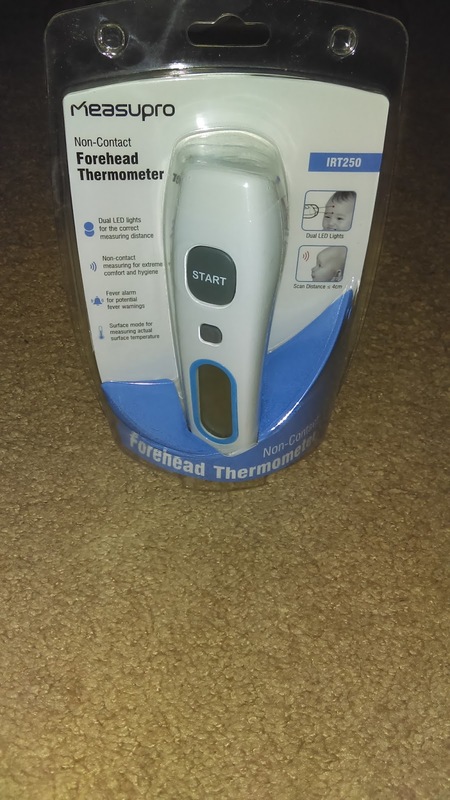 (I have a good thermometer from this same company that does both ear and forehead, and I love it). My new thermometer from Measupro is a more futuristic device. I can take my child's temperature without actually placing anything against his skin or in his ear. 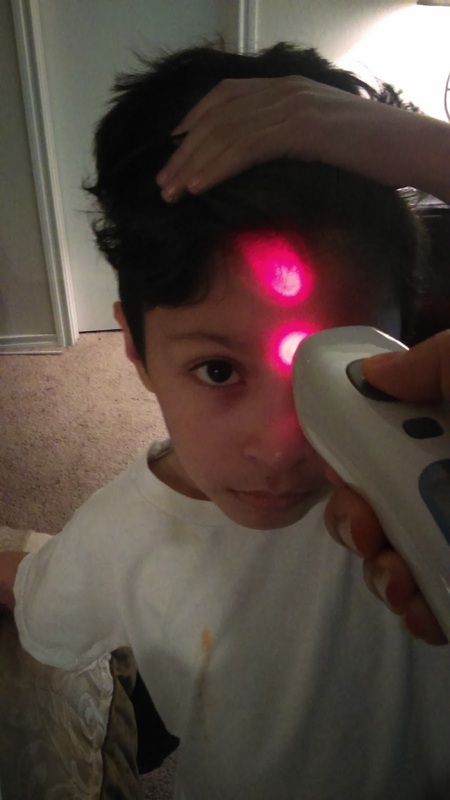 I can hold it in front of his forehead, aim at the center of his forehead, and BEEP, it tells me whether or not he has a fever. You just have to make sure both dots are vertically visible on their forehead in order to get the most accurate reading. The reading is quick, once you get the hang of it. It also has a special beep to let you know if your child does in fact have a fever. It does store the last read temp as well or as many as 25 previous readings. There is a mute function to turn off sounds. If your baby or older child is sleeping, you don't have to worry about waking them with it muted and don't even have to physically touch them. If they are awake, try and make sure they stay as still as possible. Convenient, obviously. It helps prevent you from spreading a ton of nasty germs as well. Another cool feature is that it can be switched, with the push of a button, to another setting that allows you to read something's surface temperature. This is helpful if you are considering placing a warm towel or something else on your child. It can be used on people of all ages, by the way. You can purchase your own here on Amazon.